Windows 10 came along with a lot of fresh and amazing features. One of them is the Game Bar, which is an inbuilt tool for the game lovers and those who love to record and share their gameplay ability. Game Bar is a pre-installed program in Windows 10 that enables the users to take screenshot of their game, record it and can help in sharing the recorded file to friends via uploading to YouTube. Here in this article, we will let you know how you can make use of Windows 10 Game Bar to record gameplay on PC. Before proceeding to the step guide, we would like to introduce you about Filmora scrn, which is a product by a well-known digital platform Wondershare. Filmora scrn is a screen recorder which is aimed specially for recording fast paced games. The perfection lies in it for offering 15-120 FPS and GPU acceleration ability. Windows 10 game recorder will take a little understanding of yours to get the gameplay recording task accomplished properly. Therefore, you should know about how to operate the features it provides. Here are those and how each one can help you in recording via Windows 10 game capture program. Firstly, you need to launch the Game Bar by simply tapping the Windows Key and G letter key altogether. Note: There are times when unfortunately Windows 10 game capture doesn’t run properly ultimately making the non tech savvy user not able to use Windows 10 Game Bar on PC at all. If you are also stuck with the problem, check out the solutions below to fix this issue in different scenarios. At times, when in full screen it may not appear over your game but, perhaps, it could be in the background, check whether the recording starts & stops or not when you use the hotkey combination to record a clip. Press Windows key, Alt and letter R keys altogether for initiating the recording of game. To stop the recording, press those keys again. Your screen will be seen flashing at the time of starting and ending of recording. The game recording can get hindrance if the Windows key fails to work. To fix this, you can set your own keyboard shortcuts for Windows 10 Game Bar. Just click on Xbox option and then choose Settings. Go to Game DVR option followed by Keyboard shortcuts. Now, create the desired shortcut key. Try these fixes to make the Windows 10 game recorder work properly. However, there is no absolute surety if it will work 100%. Background recording enables you to automatically record your gameplay so that you can enjoy a full screen entertainment. 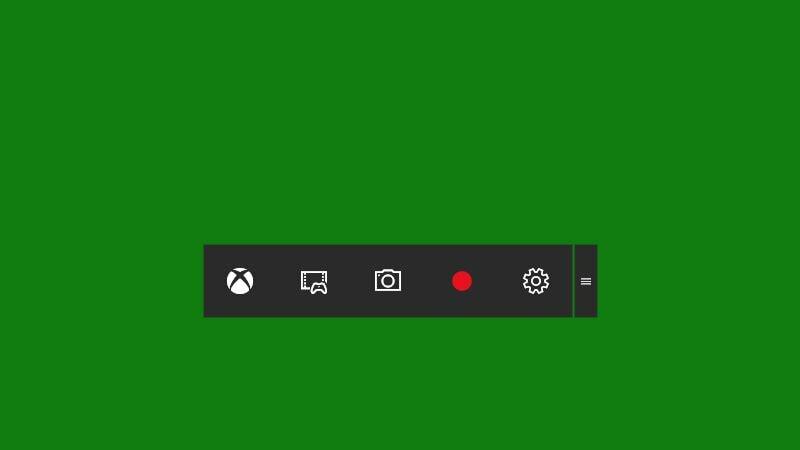 For enabling background recording, all you need is to click on the Xbox app. Go to the Game DVR Settings and toggle on the option saying “Record in the background while I’m playing a game”. 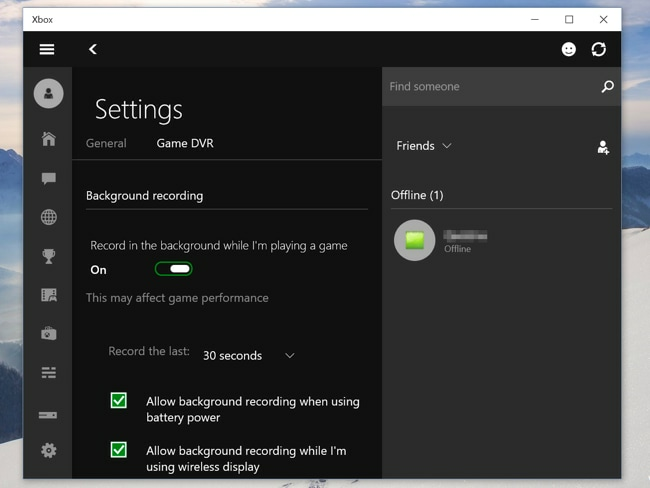 With the help of Windows 10 game recorder, you can take a screenshot of your game. This could be helpful if you want to show off your high score to your friends. To do this, look for the screenshot icon in the middle of the Game Bar and click it. Alternatively, press Windows, Alt and Print Screen keys to capture the screenshot. For initiating the recording of the game, open the Game Bar as said above by pressing Windows + G. Now hit on the red button. Your video will begin to record and you can check out the status of the recording at the top right corner on the timer occurring on the screen. To end the video, open Game bar again and hit on the same red stop button. The Gameplay video can also be started and stopped by pressing Windows, Alt and R keys. For hiding the timer if necessary, just press Windows + Alt + T.
For your convenience, we have put together all the hotkey combination in a list mentioned below which are required to be known by you to effectively record your gameplay videos. Following are all the keyboard shortcuts for using Windows 10 Game Bar. Please have a look. That was all about Windows 10 Game Bar and how to use it to record your games. Nevertheless, you can encounter with various complexities while using it because of its limited functionality. Therefore, the recommended software to record high quality gaming be it for making Game tutorials or walkthroughs or for showing off your gaming skills over the YouTube, we suggest you to use Filmora scrn that offers background recording of your gameplay with highest output quality and that too while ensuring that there is no lagging in your recorded video. Here is the list of some of the smart features of Filmora Scrn.